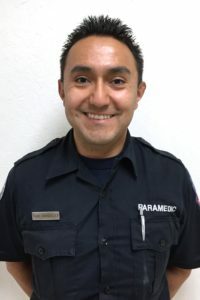 When a clinical question arises, Paramedic Ivan Gonzales is the first person other paramedics and first responders approach. Though he has only been in the EMS industry for four short years, Ivan holds deep knowledge and inspires those around him to continue their growth. Ivan is an adept Field Training Officer and highly principled caregiver. Many of the students and new employees Ivan helped teach have gone on to become excellent clinicians in their own right. An exceptional caregiver, Ivan received three proclamations from county leaders within the span of two years. One of those came last year, when he was recognized for resuscitating a teenager who suffered a cardiac arrest. The boy made a full recovery, thanks in large part to the interventions Ivan performed.